This morning I found this tweet waiting for me. The first thing I thought was “how on earth am I going to get a response to this into 140 characters?” Having pondered it a little more I had resigned myself to the fact that it would probably be a series of tweets, each one with a partial reason that together would make a whole. And then I realised that this is too good a question, or rather too complex a question, for twitter. In fact it’s probably the most important question of all, certainly the most important that I’ve never properly addressed on this blog. Before I answer it, can I deal with the question itself? (He asks rhetorically). 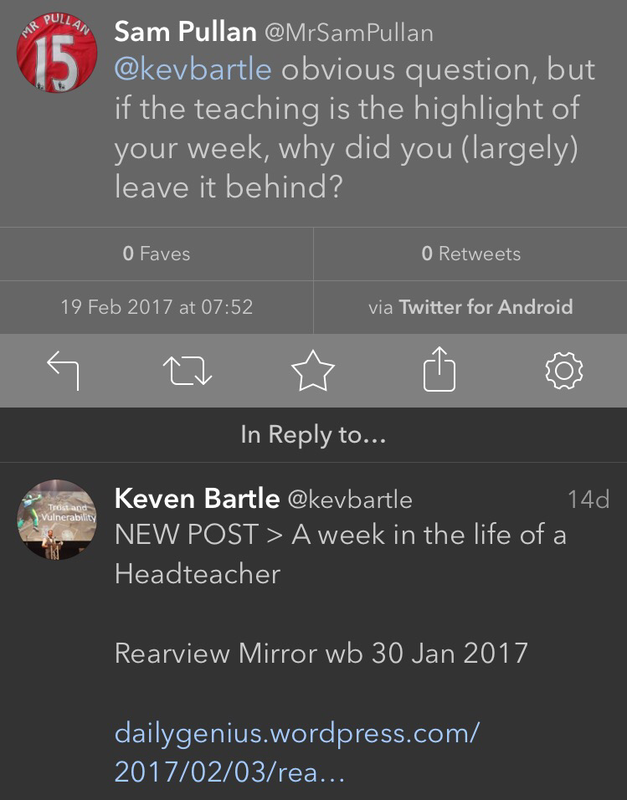 If the teaching is the highlight of your week, why did you (largely) leave it behind?